Richard (Director, Shin Shields Ltd) is a professional skier. He has instructed all over the world, but has been plagued with an on-going shin splint injury especially when skiing. Shin Shields have completely rejuvenated his career. He has managed to return to instructing and coaching in Val d lsere France. He is always striving to improve techniques and equipment. Lara (Sales, Shin Shields Ltd) has joined the team at Shin Shields. Lara raced at a national level in Italy until a serious crash ended her career. She now instructs and coaches based in Val d Isere and Courchevel, France. She is always striving to improve techniques and equipment. 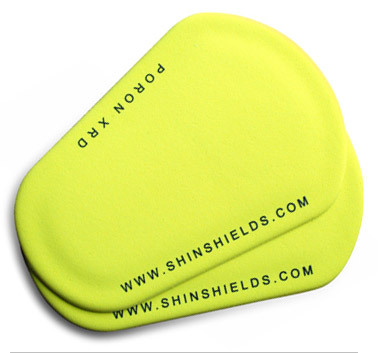 The Shin Shields team have been involved in the Ski industry for many years. This experience is the driving force behind the development of Shin Shields and Shield Thermal Protection, making skiing comfortable for people of all abilities. Shin Shields are designed to help prevent discomfort caused by the impact and pressures encountered when wearing ski boots. 175mm x 125mm. 3mm thick graded to 1mm around the edged to reduce pressure. One size fits all. The ergonomic shape has been specially developed to fit the contours of the leg, adding support but more importantly comfort. Shin Shields are 3mm thick which after months of testing was found to be a perfect thickness to completely protect the shin without affecting the performance of the boot. The new design reduces the depth from 3mm in the centre to 1mm around the edge. This helps to ease the pressure around the edges further increasing comfort. The anti-friction surface next to the skin reduces rubbing and pulling from indirect and shock impact such as falls and landings, helping prevent injury to the lower leg. The outer surface creates friction against the sock keeping the Shin Shield in place. Once bruising starts it will only get worse if you continue skiing. Shin Shields can help to combat this by making a non-contact area around the bruise. 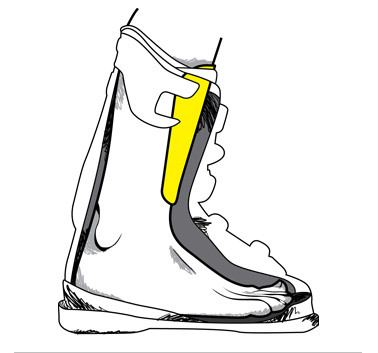 By cutting a hole slightly larger than the affected area into the shields and placing it against the skin, Shin Shields can help to alleviates the contact on the front of the boot without affecting performance. 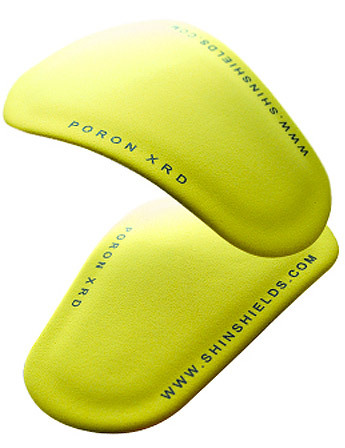 Other Shin Shields can be cut and placed above as needed. All injuries are different and medical advice should always be sort prior to use. or use the contact form below. & We will get back to you shortly!